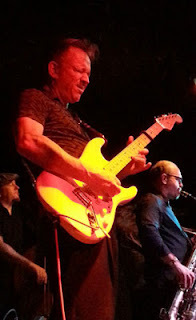 An extra full house was the scene recently at the Rhythm Room, Phoenix, AZ USA when blues legends and veteran road pros Nick Moss and Jimmie Vaughan delivered killer sets of tasty Blues. Chicago based Nick Moss and Michael Ledbetter (guitar and vocals), were joined by Bob Corritore (harmonica and vocals) and drummer Patrick Seals for a full hour of house rocking ‘Chicago style’ tunes. Just two weeks into a seven week Western USA tour this group was jumping. According to road tour manager, Javik Smith (son of Willie “Big-Eyes” Smith) the core band will work the West for five additional weeks, take a short rest and then head out to the Eastern leg of the USA as the summer progresses. Moss showed his decades of experience through the fret board runs, fills, comps and seamless blending with guest harmonica player Bob Corritore and members of his regular band. Great support came from Michael Ledbetter on rhythm guitar and vocals who has been with Moss for the past two years. Classically trained in Opera, Ledbetter calls Elgin, Illinois home. Once again, opportunity comes to those who prepare themselves. Sounding like a page out of Mike Bloomfield’s biography, Nick Moss initially discovered Ledbetter through a recommendation from one of his friends. Gradual collaboration between the men evolved over time. A one-off gig turned into occasional fill-ins which in turn eventually lead to a regular spot on the Moss stage. Kudos to Illinois resident and experienced pro drummer Patrick Seals who set the beats and drove the tempo. Seals’ background includes Jazz Studies and Instrumental Performance at Columbia College, Chicago. This year, Nick Moss received his 16th nomination from the Blues Music Association for "Best Blues Rock Album" for Here I Am, which debuted at number 2 on the Relix/Jambands Radio Chart, and at number 6 on the Living Blues Radio Chart! This latest CD is Nick’s ninth release on his own Blue Bella Records label. The place was primed and pumping by the time that Jimmie Vaughn and his Tilt-a-Whirl band took the stage. Scorching through a 21 song set, of songs mostly from his 2010 release, Plays, Blues, Ballads and Favorites, Vaughan and his band barely stopped to take a breath. The crowd began with respectful reserve leaving breathing room on the dance floor and was on their feet and shoulder to shoulder by the end of the last song. Everyone knows about Vaughan but we should be reminded of what a great group of players make up the Tilt-A-Whirl team. Horn section really stood out as a huge asset. Professional to a tee was the drummer, bassist and rhythm guitarists who performed flawlessly and barely took a bow for their efforts. Good music, like photography, looks easy and natural when done well. These folks blended like prize-winning Barbeque. Founding member of Double Trouble, Lou Ann Barton joined the group for a flurry of songs including Shake A Hand, Scratch, signature duet Wheel of Fortune and Middle of the Night. Jimmie stayed on stage for 6 String Down while the band took a quick break. Motorhead Baby, Middle of the Night (with Barton), White Boots and D/FW closed out the performance. It was striking at how nice, personable and frankly politely approachable Vaughan was as he took time to patiently sign autographs and meet/greet following the 180 minute performance. Strong encouragement to watch for and attend performances by both Moss and/or Vaughan. I for one got more than my dollars’ worth at this show. Thanks again to Bob Corritore, Phoenix Blues Society and the Rhythm Room for an excellent time. Indeed it is my old buddy Doug James on baritone sax! He's been playing with Jimmy Vaughan for a few years now.